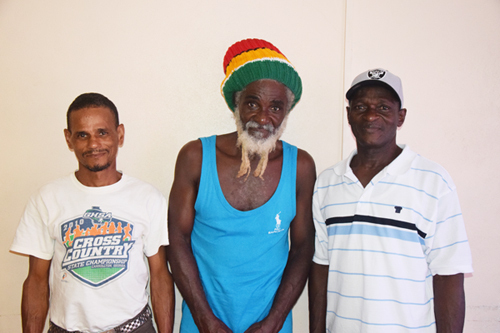 From left, Gary Hartog (competitor) with Carlton ‘Corn Man’ Stephenson and Errol Giddings (committee member) pose for a photo. Seven years ago, Carlton ‘Corn Man’ Stephenson embarked on a one man 24-mile marathon from ‘Red Shop’ Sophia to Uitvlugt to celebrate the abolishment of slavery and now, seven years later, the tradition continues under the title of the Uitvlugt Community Development Committee (CDC) seventh annual Emancipation run. The run, which has gained traction with scores of competitors, has turned into a mini-rivalry between ‘Corn Man’ and Gary Hartog; who won the race last year in a meet record time of 2hours 58 minutes. This year, the race begins at 03:30hrs at ‘Red Shop’ and organiser of the run, ‘Corn Man’, noted that transportation will be available for those desirous of following the race from the starting point while there will be Police escorts from the Demerara Harbour Bridge to the finishing point at Uitvlugt’s Liberty Square. Prizes include trophies and medals and will be handed out to the top performers while registration for the race is free. For registration persons can contact Gary Hartog on cell phone 691-9823 or Errol Giddings on 690-3122.